The Glass Farm Ensemble has neither to do with famous Minimalist composers nor agriculture. They happened to start operations in 2000 at the Glass Farm Building in Manhattan's far West side and have been performing their brand of genre-bending music in non-standard venues ever since. With roots in Switzerland and New York, this group of no-slouch instrumentalists is used to smashing cultural worlds together, and do so with ferocity in their first CD, In Four. All but one of the works on the program was written for the group, and its line-up of saxophone, electric guitar, piano, and percussion unites the worlds or rock, jazz, improvised music, chamber music, and experimentalism. As suggested by the title of Glass Farm composer-pianist Yvonne Troxler's Kaleidoskop, there's a lot of facets to this music. The European-American mix of works on the disc begins with Louis Andriessen's Hout, which both spawned Glass Farm Ensemble's instrumentation and defined its concerns: music that is driving, rhythmic, rigorous, and unforgettable. "Colored glass windows, like those one sees in churches, and the light that shines through them," were the visual impetus for Yvonne Troxler's Kaleidoskop. Peter Herbert's Deafening Silence, "a tour de force between fff and ppp." While the work on the surface references the sound and feel of jazz, it is also an exploration of the full breadth of the instruments' sonic possibilities. Much like Elizabeth Hoffman's finely detailed, almost tactile music, the title, holonyms, "invites one into the experience of making sense of a word never heard before, whether real or nonsensical, or a distortion of some sort, which is analogous in a way to our experience of constructing meanings from music." Closing the disc is Wolfgang Heiniger's In Four capturing the raw power of which the group is capable. The composer writes that although he wanted to conjure up, "some reminiscence of my youth when I used to play in a punk band, In Four hasn't much in common with rock or jazz." The unusual instrumentation of the four-member Glass Farm Ensemble appears to be a magnet for cutting-edge composers. Of the five works on this recording, four were written expressly for the group and its complement of saxophones, electric guitar, piano and percussion (including such rarely employed items as colander and toothbrush). In most cases, the results are beguiling, though the menu is a bit skimpy. At 47 minutes, the disc could have accommodated several more pieces. But what’s there is varied, challenging and often engaging. The most alluring work is the opener, Louis Andriessen’s Hout, the one score not written for the ensemble. It is a high-energy canon that rarely stops to take a breath. The instruments race after one another until they appear to be cornered. They join in unison riffs, only to be confronted by decisive wood taps. The ensemble’s pianist, Yvonne Troxler, is the composer of three finely wrought, concise essays under the title Kaleidoskop, which suggests the music’s range of moods and distilled sonorities. Peter Herbert`s Deafening Silence also travels a spectrum of sonic atmospheres that deftly convey the oxymoronic aspect of the title. The colander and toothbrush, as well as a hairbrush, show up in Elizabeth Hoffman’s Holonyms, which is replete with intriguing layers, colours and rhythmic gestures. In Wolfgang Heiniger’s In Four, whiffs of popular styles help animate the narrative, as does an electric guitar slightly mad. The musicians of the Glass Farm Ensemble play all of these works with what seems to be endless reserves of virtuosity and panache. Taimur Sullivan is a whiz on soprano, tenor and baritone saxophones, while Matthew Gold is evidently undaunted by the slew of percussion instruments he is called upon to tap, brush, rub, whatever. The group includes Troxler, another intrepid artist, and Oren Fader, who draws from his electric guitar both subtle nuances and earsplitting explosions. The Glass Farm Ensemble, a chamber music group formed by relatively young musicians, boasts an unusual instrumentation: saxophone (soprano, tenor or baritone, according to the score's requirements), electric guitar, percussion, and piano. This line-up came about because of Louis Andriessen's 1991 piece Hout which appropriately opens In Four, the group's first recording. Hout is a fun, intricate weaving of four distinct yet related melodies with a strong rhythmic drive, and the Glass Farm Ensemble pulls it off gracefully and lightly. The other four pieces on the CD are all premiere recordings. One comes from the ensemble's inner circle: pianist Yvonne Troxler's three-part Kaleidoskop, sadly a little too alike Hout to make a mark right after Andriessen's work. Peter Herbert's Deafening Silence kicks off with a few loud guitar chords, hinting at a rock format that will never really crystallize, although things will get very beat-driven, with percussionist Matthew Gold playing the drum kit. Sadly, the kit is recorded classical orchestra-style, which robs the piece of its "oomph" factor. That rock element is better treated in Wolfgang Heiniger's In Four which calls for an extended drum kit, potent electric guitar, and tutti half-note runs reminiscent of rock-in-opposition groups like Henry Cow or "musique actuelle" artists like Rene Lussier. Stylistically, In Four draws favorable comparisons to (Bang on a Can All-Stars). It can appeal to fans of avant-prog and contemporary music with a rock edge, although Glass Farm Ensemble would never be mistaken for a rock band. 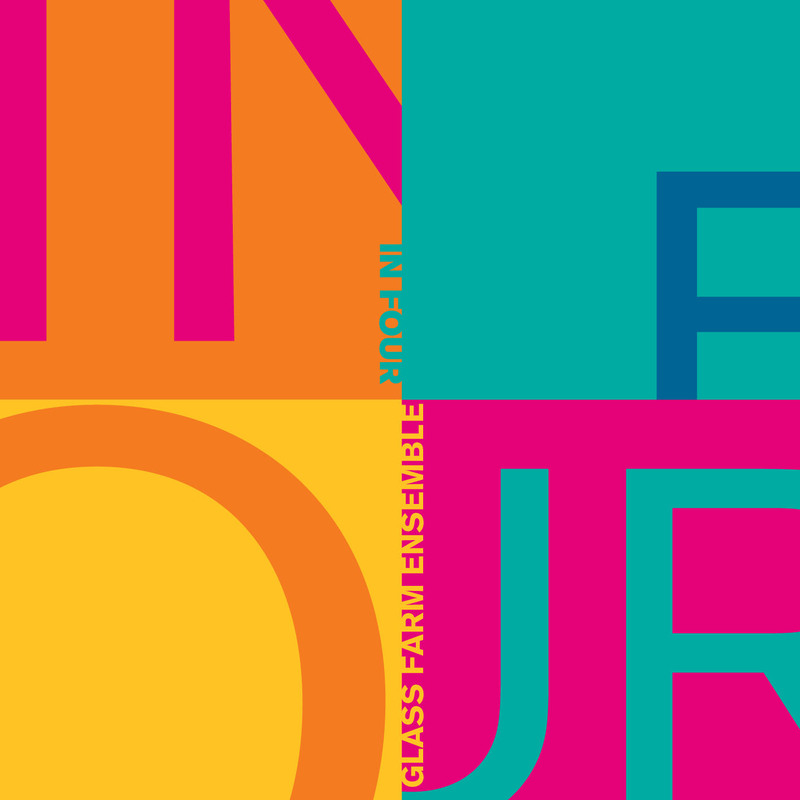 If you think you'd might like some exciting new sounds made by a quartet of saxophone (soprano, tenor or bass), electric guitar, percussion and piano, then the Glass Farm Ensemble is for you. Individually and collectively, the instruments honk, squeak, whine, cry, batter, tick, tock, clang, chime, sing and generally surprise. All but one of the works on the program was written for the Glass Farm Ensemble's regular line-up; all five move easily if ambiguously through a universe of musical galaxies that might be variously described as rock, jazz, experimental, contemporary, and so on. The stunner on this disc is Yvonne Troxler's "Kaleidoscop," which takes a basic musical concept and works miracles with it, highlighted by an unforgettable,cartoon-ish central movement that recalls Bugs Bunny playing classical piano at the Hollywood Bowl. Peter Herbert's "Deafening Silence" is a riveting voyage through unpredictable soundscapes. The music by Louis Andriessen and Elizabeth Hoffman reveals their beauties less easily, and Wolfgang Heiniger's "In Four" is an initially dour, introverted mood piece. The Glass Farm concerts were inaugurated in 2000 when pianist Yvonne Troxler began performing programs of new music by cutting-edge American composers and by Europe's thriving new music scene in the industrial Glass Farm Building on Manhattan's far westside. By the fall of 2003 the Glass Farm Ensemble had moved to the Tenri Cultural Center, a non-profit organization in Greenwich Village whose mission is to promote the study of Japanese language and the appreciation of international art forms. As with the best audiophile recordings, the quality of the performance is crucial. Here, each of the instrumentalists is almost supernaturally alive to the quality of each sound they make, making listening to the recording as much of a tour de force as it must have been making it. In sum, very good stuff, with liner notes by the composer. The new repertoire written for Glass Farm Ensemble so far is interesting and their superlative playing is enough to make up for any weaknesses in it. In Four is a very impressive début album.